A charming old farmhouse has been sympathetically restored yet maintains its cottage feel located 2 miles from Ballinrobe. 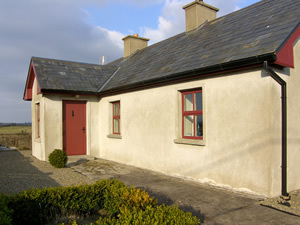 You are situated in rolling landscape divided by stone walls leading to views of mountains of Mayo. There's a golf club 500 yards from the property and trout rich lakes of Lough Mask, Lough Corrib and Lough Carra near at hand. The location is an excellent base for walks and visits to nearby towns of Westport, Castlebar and Galway and a number of outdoor activities not least of all a climb of Croagh Patrick.Shop. Pub. Restaurant 2 miles. Beach 17 miles. Lakeside 3 miles. GF: lounge/diner, kitchen, 2 doubles 1 with ensuite shower room, bathroom.Electricity and oil central heating included, linen and towels included, No Smoking, oil-fired stove, cot, high chair, TV, dvd player, CD, freezer, microwave, washer/dryer, hairdryer, uk tv channels, welcome pack, partially enclosed garden, enclosed private courtyard, patio area, patio furniture, off road parking, free bicycles available. Sorry no pets.